I have been hiking with dogs for almost 15 years now. I still manage to forget to pack something every now and then – especially when I am getting back into the swing of things at the beginning of the season. For example, I know better but have been leaving the bug spray at home because we haven’t rain into any major bugs in a while….until our hike to Eagle Lake. The mosquitoes were thick there and left me cursing my complacency. Over the years, I have learned what I need to put in my backpack to make my day relaxing, comfortable and take care of any minor mishaps. This is what I bring on our hiking trips. Let’s start with the foundation – the actual backpack. When you hike with a big dog, they can carry some of the load. Small dogs usually can’t carry a pack or, if they do, you can’t put a whole lot inside of them. When I hike with Chester and Gretel, I am their Sherpa – I carry everything for the three of us. The minimum size pack that I use for a day hike is 20 liters and the maximum is about 40 liters. Liters are the volume of stuff you can put into the entire bag, including all of the small pockets. However, I use a “hydration pack” so the water goes in a bag in the back compartment with a hose to drink out of – I don’t have to make room to carry an extra water bottle for me. 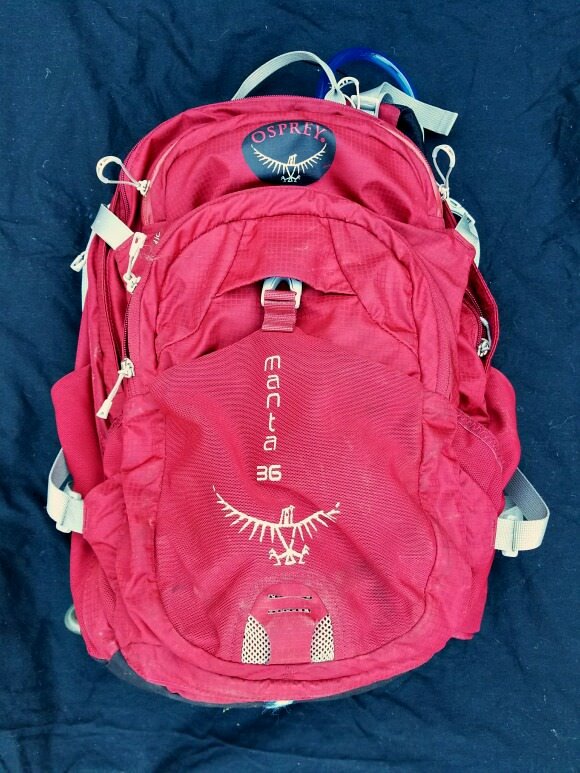 My favorite pack is the Osprey Manta 36 (mine is old – the updated equivalent is the Women’s Mira AG 34). It has plenty of room for the stuff I take on a short day hike but I can pack enough in there for a hike that lasts all day too. It has just the right amount of pockets and is well ventilated to allow airflow between the pack and your back. Compared to what I see most people carrying on the trails, I am over-prepared. However, I like to be comfortable, for Chester and Gretel to be comfortable, and be prepared for the weather to change. This is what I carry on our hikes if they are going to be under 5 miles. Delorme inReach Emergency SOS Beacon with Two-Way texting capability (now made my Garmin) – Now this IS overkill. However, I own it, often hike alone with the dogs, and would kick myself if I got injured or had an emergency and didn’t have it with me. I can summon search and rescue with a press of a button and can sent text messages back and forth with my hubby to let him know I’m ok (and to emergency personnel in case the need help finding me). If you are new to hiking, hopefully this little list will help you be prepared and have a great experience out on the trail. It will also serve as a great reminder for me at the beginning of each hiking season. 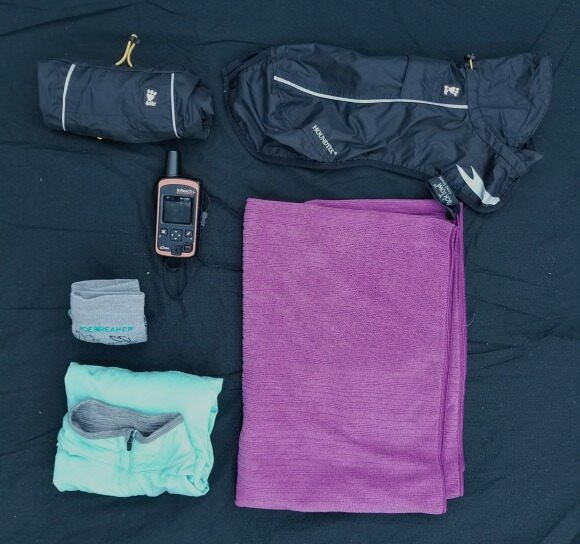 If you are a seasoned hiker, please leave a comment telling us about your must-haves. Great list! The cell phone is a must. I had a friend whose dog was injured and she did not have her phone. She had to carry her 50 pound dog several miles before she found someone to help her. Also, if you have reception, turn it off, turn off the ear buds and just enjoy nature, the dogs and the person(s) you are with. Getting in tune with nature not your “tunes” is so wonderful! I have all those things, plus I always take a camera. (I’m not real good on the bug spray either) One good thing about Torrey, she can carry water and a bowl for her and Roxy so I don’t have to. This works great for longer hikes. Yeah, I forgot camera on the list. I’m going to add it. I don’t go anywhere without my camera…especially as a blogger 🙂 I did go kayaking with a friend the other day and took NO PHOTOS. It was nice to not have to thing about that and just enjoy the frogs, turtles and birds. Our excursions are not as long as yours are, but thanks for the list of things we might need as we work into more complex ventures. Oh, I take this on every hike that we do if it is actually in the woods. 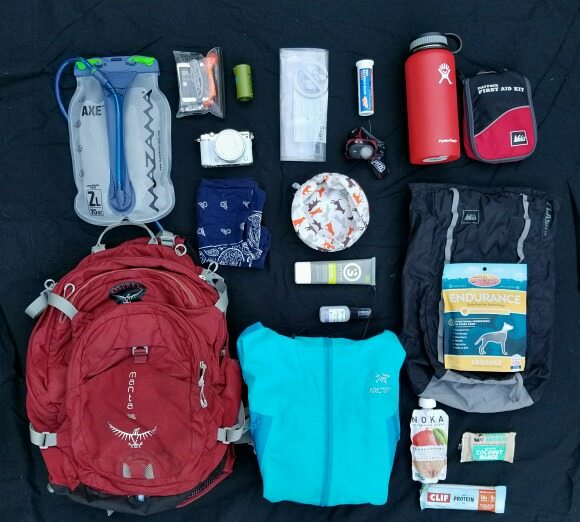 I don’t bring all of this if we are hiking trails in city parks but if we are away from civilization it all goes, even if our hike is only a couple of miles. This is my list for smaller hikes! If I was going all day or overnight the list would be longer. Once we actually get out to camp overnight, the longer list of what goes in that backpack will come. Yes, the trails we hike are primarily marked. If there are any unmarked trails they are not very long. Great article. I know cell phone reception is usually a no go but they also have cell chargers that are solar operated. These are good for emergencies if you end up stranded for a bit. You never know if you may get that glimpse of service for a moment, you want a charged battery. Love the info on the flash 18 pack, although my guy would NEVER fit. lol Makes me think-going to look around and see if they have anything out to help with the big guys incase something happens. They do have sling-type carriers…similar to the kind parents carry babies in. They’re maybe not the most comfortable (neither is the flash 18 pack) but we are talking about emergencies here. Still, I imagine they only work to about 20 lbs max. For heavier dogs I suggest a bed sheet that you and your hiking friend could carry like a cot. I like “hiking” but since I pretty much live in a flat area…it is nothing like your hiking. I also have lived in more urban areas. Most of the time it is well marked and well traveled paths in county or state parks. Where do you live again? Seattle is very urban but we are unique in that we have “wild” mountains we can drive to in less than an hour. That’s a pretty great list! The extra socks are a great tip, I always forget to pack things like this! It was interesting to see what’s inside your pack! There’s no way that I could ever carry a Lab out of the wilderness so I carry a Spot (emergency beacon) so I can get people to come help me if it comes to that. You sure are thorough! I’m going to take a few of your ideas. Yeah, a Spot is a great idea for larger dogs. If we are hiking for several days, or deeper into the wilderness than we can carry the dogs out, we bring a Spot. I will try to remember to include that when I make my “overnight backpacking” list. Wow! That’s pretty impressive. I almost purchased a backpack like that at Costco, but we haven’t gone on our first hike yet so I thought I might be jumping the gun. I’m so glad that I read this, because I was planning on heading out next week and I would have treated it like a regular walk and I should know better. Luckily our hiking area is a stone’s throw from home, but when I hike in a strange place I would also include an emergency blanket (one of those lightweight silver ones) and clothes pins to make a make-shift shelter. That’s a great idea Jodi. I guess I just figure 1) the trails are so established and well-traveled that I won’t get lost and 2) I can create a shelter MacGyver- style out of branches and stuff. One shouldn’t be too confident though. What if you are too injured to gather branches? Jessica what kind of flavor do you put into their water to encourage them to drink while hiking? It is really hard to get my little Lily to drink on a hike even when I can tell she is hot/thirsty. I end up carrying a bottle of water for her and Bruno and end up bringing most of it home. Ugh! It totally can be. Chester love to drink water and gulps it down whenever I give it to him. Gretel not so much. She gets overstimulated and can’t focus on the water in front of her. I know how important it is for her to drink water though and stay hydrated when we are hiking. Adding something to their water definitely gets the job done. When we are doing strenuous exercise, I add K9 GoDog to their water. It’s like a sports drink for dogs. You can find it here: . I use double the water they say for a serving and it still works great. If we are just out in the heat but not doing anything strenuous, I just add a splash of low-sodium (or not sodium if you can) bone broth to their water. Hope that helps. Happy hiking! Great article. 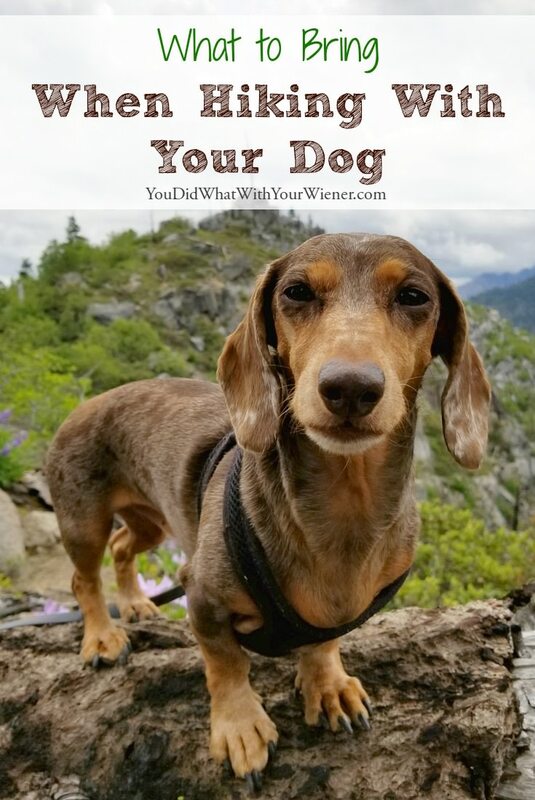 I have a 9-year-old dachshund and I frequently hike with him. We live in Utah so there are endless amounts of trails everywhere. During the warmer months, we try to do a “peak a week”. People are always so amazed that my little doxie, Rocket can make it to the top of the mountains(and with ease!). I am like you, I overpack my bag. My husband makes fun of me all the time. But when we hit the trail alone, it’s better to be safe. The only additional item I take on the trail is a water filter like a Life Straw. When I plan my longer hikes, I try to pick trails I know have water. That way, I don’t need to bring as much water which decreases the weight of my pack significantly. Great article and website. It’s so fun to see more doxies that love hiking so much! I’ve been thinking of getting a Life Straw. I just carrier water purification drops right now.